Tiffany Walker was born in North Carolina. Her father served in the United States Air Force and her family often moved as a part of his career. Mrs. Walker graduated from Tusculum College having earning a Bachelor of Science in Management. Tiffany’s career began in 1996 with Wachovia Bank of Charlotte North Carolina. As a part of Wachovia, she relocated to Hilton Head, South Carolina. 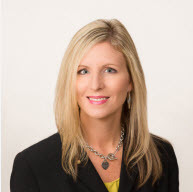 Tiffany then began working for Regions Bank and relocated to Knoxville Tennessee in her position as a bank Vice President and Branch Manager. Mrs. Walker later accepted a position as Director of Real Estate Lending with Elite Service Mortgage. She has extensive training and knowledge of residential, consumer and commercial lending. Tiffany is active in her church, her community and has served in various leadership positions and on the Board of Directors of the Rotary Club of Knoxville. Tiffany’s faith and family are very important to her. She has been married to Steve, her wonderful husband for over 10 years. And, they have two active sons. Ms. Walker enjoys serving the Lord, volunteering, attending The University of Tennessee sporting events and watching her children play sports. Her family enjoys the outdoors and can often be found boating on Norris Lake! When asked about her goals, Tiffany reports that she wants to live each day to please God and to be a great steward of His blessings!